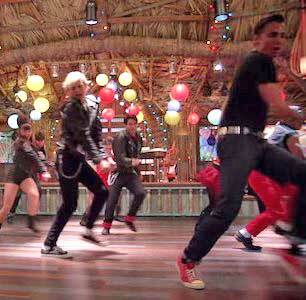 Teen Beach Movie is a Disney Channel Original Movie (DCOM) that premiered on July 19, 2013, on Disney Channel, and in the years since, has gone on to be a DCOM cult classic. In the same vein as other DCOMs High School Musical, Halloweentown, and The Even Stevens Movie, the film has become a huge part of people’s childhoods. The film follows Brady (Ross Lynch) and Mackenzie (Maia Mitchell) as a normal day of surfing leads to them being transported into the musical film West Side Story. The track “Cruisin’ For A Bruisin’” is one of the signature songs of the film, and the music video for it has garnered over 77.5 million views on YouTube. Multiple people wear black or red chucks in this video. The song is a mix of Beach Boys style surf music with Broadway show tunes, which is appropriate considering the setting of the movie. It features Lynch’s character Brady coming in midway through the track, as it’s at this point in the film that he decides to join in with the musical’s cast in singing like it’s a completely normal thing to do. The song also features the vocals of Grace Phipps, who plays Lela, the female lead of the film. The song is actually pretty catchy, and features a cool Chuck Berry-esque guitar solo after Brady’s verse. It’s easy to see why so many kids who grew up watching this movie on repeat can still sing the words to this today. While the movie may act as a tribute to the film/musical West Side Story, the music video is more closely an homage to Grease, with the guys dressed in black leather jackets and the girls dressed in pink. This of course means that there are people wearing chucks, including Ross Lynch wearing a black pair and a backup dancer wearing a red pair. 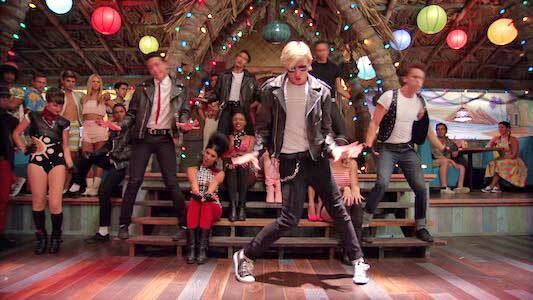 The video starts with Grace Phipps and a group of girls hanging around a jukebox in a tiki hut, while a guy starts snapping to the beat. A whole “gang” of dudes then jumps in, and a whole musical number breaks out, much to McKenzie’s dismay. This is where this video’s strongest asset comes into play: its surprisingly great choreography. The dancing in this video is incredible, and the moves displayed by the actors both solo and as a group are impressive. Overall, this is a catchy song and fun video that was a major part of an entire generation’s middle school years. This video is definitely giving off Grease vibes. Use the links below to get yourself a new pair of red or black chucks.